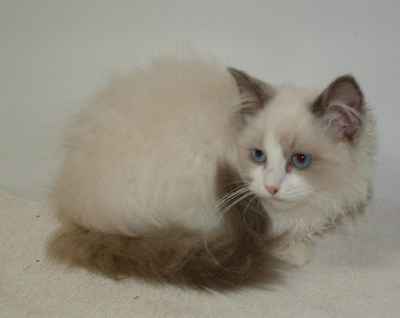 The Ragdoll is a cat breed with blue eyes and a distinct colourpoint coat. It is a large and muscular semi-longhair cat with a soft and silky coat. Like all long haired cats, Ragdolls need grooming to ensure their fur does not mat. Developed by American breeder Ann Baker in the 1960s, it is best known for its docile and placid temperament and affectionate nature. 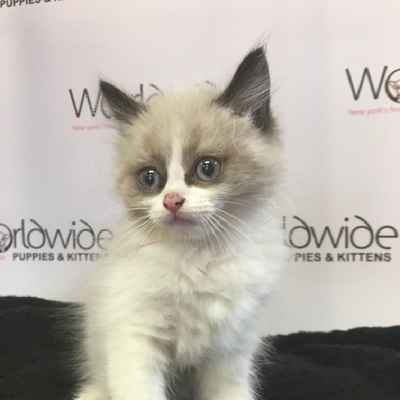 The name "Ragdoll" is derived from the tendency of individuals from the original breeding stock to go limp and relaxed when picked up. 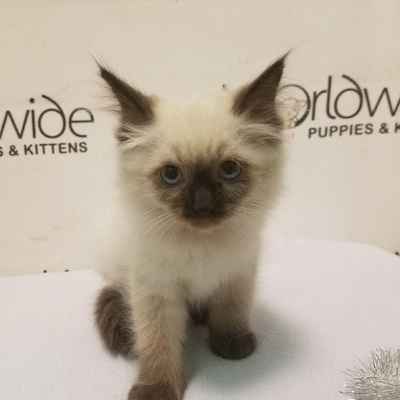 Particularly popular in both the United Kingdom and the breed's native United States, ragdoll cats often are known as "dog-like cats" or "puppy-like cats" due to behaviors such as their tendency to follow people around and their ease at being physically handled. 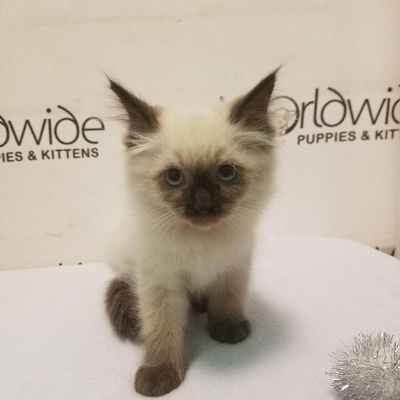 The Ragdoll is marketed by breeders as having a docile, calm and floppy nature with claims that these characteristics have been passed down from the Persian and Birman breeds. Opinions vary as to whether this trait might be the result of genetic mutation. The extreme docility of some individuals has led to the myth that Ragdolls are pain resistant. 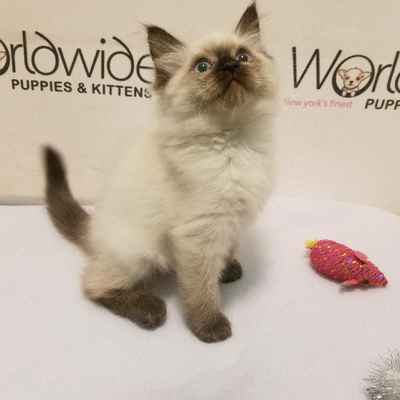 Breed standard marketing and publicity material describe the Ragdoll as affectionate, intelligent, relaxed in temperament, gentle, and an easy-to-handle lap cat. The animals are often known as "puppy cats", "dog-like cats", "cat-dogs", etc., because of their placid nature and affectionate behavior, with the cats often following owners from room to room as well as seeking physical affection akin to certain dog breeds. Ragdolls can be trained to retrieve toys and enjoy doing so. The Ragdoll is one of the largest domesticated cat breeds, with a sturdy body, large frame, and proportionate legs. A fully-grown female weighs from 8 to 15 pounds (3.6 to 6.8 kg). Males are substantially larger, ranging from 12 to 20 pounds (5.4 to 9.1 kg) or more. 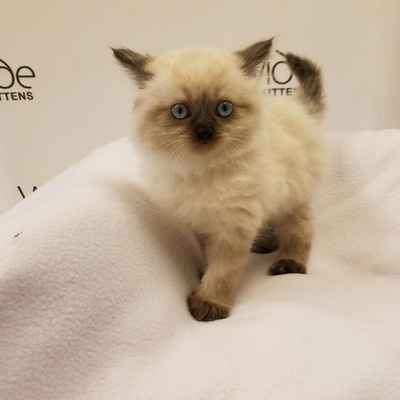 The genes for point coloration are responsible for the blue eyes of the Ragdoll. More intense shades of blue are favored in cat shows. 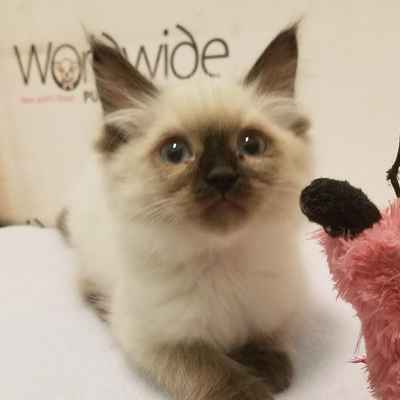 Although the breed has a plush coat, it consists mainly of long guard hairs, while the lack of a dense undercoat results, according to the Cat Fanciers' Association, in "reduced shedding and matting". 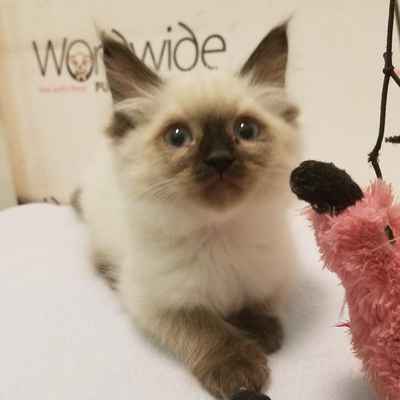 Ragdolls come in six different colors: red, seal, chocolate and the corresponding "dilutes", including blue, lilac, and cream. This also includes the lynx and tortoiseshell variations in all colors and the three patterns. 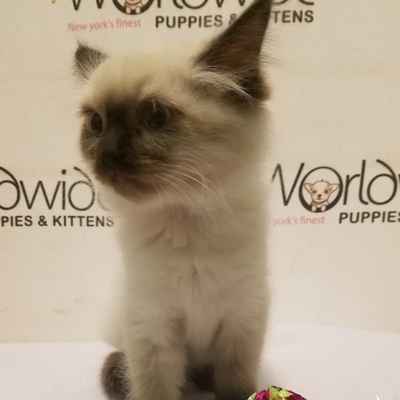 Ragdoll kittens are born white; they have good color at 8–10 weeks and full color and coat at 3–4 years.